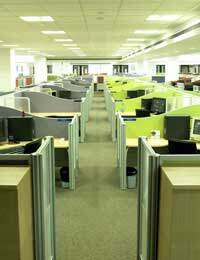 There is a huge variation on the quality of office environments. Excellent commercial interior design can result in sophisticated workplaces designed to increase productivity, motivation and team working. On the other hand, some offices are terrible sixties buildings with very little daylight and depressing décor. If you are lucky enough to be in one of the first types, you will face different issues regarding your open plan office. These modern, fresh offices are great when you are having a good day, when you’re on top of your workload and feeling positive. You are able to interact with your colleagues, making upbeat, project enhancing phone calls and actually hope someone overhears your call. What these light, open offices are not so good at is when you are desperately trying to claw back a problem client, are having a fat, spotty day or you are trying to avoid Barry from accounts. The best way to manage those days is to not draw attention to yourself. If you are able to make a difficult call from a meeting room, take yourself off for ten minutes and make the call in peace. If you have to call from your desk, you could wait until nearby colleagues are at lunch, or making coffee. If you are trying to avoid someone, at least you can use the open plan office to your advantage. Try to keep your wits about you and move away from your desk when you see them coming into your department. If you work in a far more dowdy environment, you may find it hard to feel creative at work, or maintain a sense of positivity when talking to clients or asking them to attend meetings at your office. You could instead arrange to see clients at their offices, or a relaxed coffee shop nearby, depending on the nature of your meeting. You could try to improve your personal space by putting a pot plant on your desk and making sure you keep it organised, with modern stationery. A lack of daylight in your working day can make you feel lethargic and low, especially during the winter months when you are unlikely to get daylight outside of office hours. A good way to counteract this is to take as long a walk as is practical in your lunch break. Even ten minutes to by a sandwich and back will help raise your mood and help you feel in a more natural, relaxed frame of mind. Universal issues in open plan offices, regardless of décor or atmosphere, include people over hearing your private phone calls, the food smells at lunch time, everyone being able to see when you are even a couple of minutes late and the embarrassment of your toilet habits being public knowledge. These may seem like over-personal issues but the reality of working in an open plan office is that the privacy you may have had from your own office, or at least separate departments, is greatly reduced. There will be practical steps to deal with these issues, such as making calls from your mobile at lunchtime or using toilets on another floor after meetings, making coffee or after lunch. The benefits of open plan working are more keenly felt by management as they are able to monitor their staff, but employees can also see the value of their office design if they can address their own issues with privacy and personal space.